I mean with something like the Schwalbe Super Moto X or Kenda Kwick Seven.5 with 27.5" wheels? Would you choose either disc brakes or V-brakes like the Tektro M730? Also, with mudguards as standard equipment? 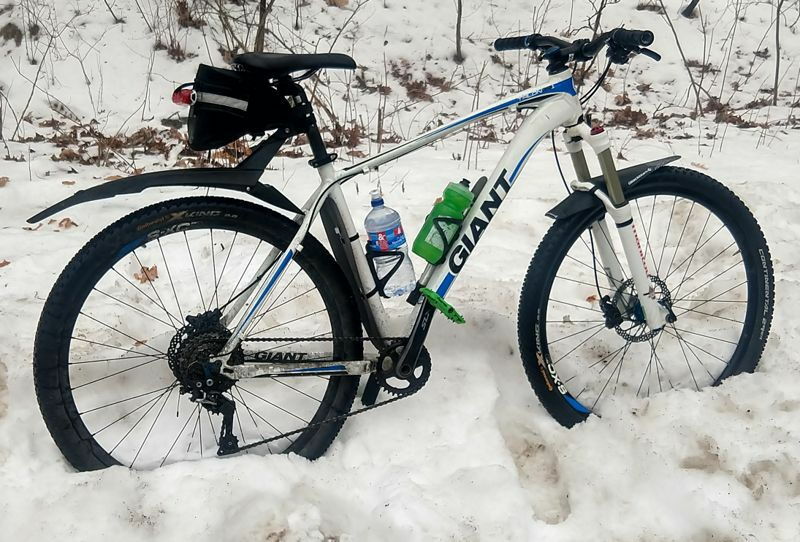 fat tires, disk brakes & fenders? oh yeah! I know you're probably not dumb but you know the circumference would be pretty large right? Would you still choose a 29er? Many here already have, or close to it: the Specialized Roll comes with 27.5 x 2.3" tires. I'd like to convert my Roam from 29" wheels to 27.5" wheels, and then use a 2" or greater tire on it. I have 29 x 2" tires on it now, and they make the bike just a hair tall. A 27.5" x 2.3"ish tire is about the same overall diameter as a 700x38. One of the things I like about disc brakes is you can do this with rim sizes relatively easily. Unless you are small, I don't see the disadvantage of large wheels. 29+ is an actual category offered by a few manufacturers. Rolls better over rough terrain. While not a particular hybrid or fat tire user, I am planning to build a bike around the Surly Extra Terrestrial tires sometime in the near future. Drop bars, of course. Probably front suspension. Generally intended for rough gravel riding/touring. A rigid mountain bike? Yes. A "hybrid" not so much. The wide tires just kill the utility for street use. My feeling is it is too far in the dirt direction to be called a hybrid. Virtually all of the mid to upper range suspension systems have a lockout feature. But, yes, there is extra weight and complexity. It will be an interesting experiment. Then I could do something different for number 2. No. Tires that wide (and suspension for that matter) are for mountain bikes. But then, these bike category labels are fairly blurred, so call it, (and get) what ever you want! Well, I meant the same geometry as a hybrid. But, possibly with a semi-aggressive posture so you can bend your elbows and go faster when you're in a rush. I read & understood the question. 2.5 is just too wide for road use. Broken and terrible or not. IMO, about 41c is probably just about ideal for what you are describing your conditions are. So my answer remains that I would not buy a hybrid with 2.5 inch wide tires. You could always buy the bike with the wide clearance for future options & install tires more suited to current conditions. In that case, it might be a smart buy. See if the bike shop will swap for better tires & you might be a happy camper. How can this conversation even begin with so little information. How and where you intend to use it matters. Sure I would. 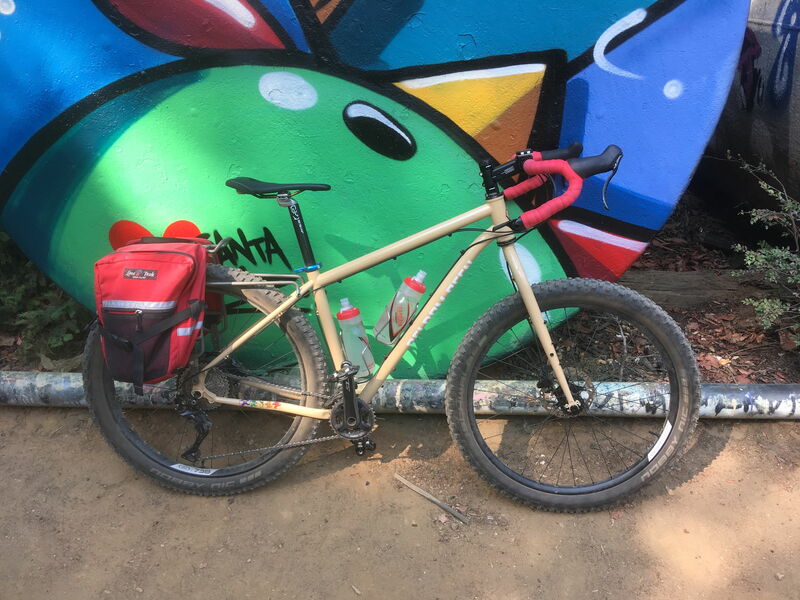 Here's my do it all mtb, 29er and 2.2" tires (continental x-kings). I ride a lot of pavement with it in the winter, total blast. I also obviously use it off road in the summer so it has the suspension fork. I can easily pump out 50 miles with it, it's about choosing good rolling tires and pumping the air pressure up. I'll keep the pressure at about 40psi on pavement unless there's alot of snow and ice. I've always wanted an N+1 bike that had a light frame, lighter wheelset and rigid fork with the same tires. Believe it or not, I wouldn't mind using a bike like that like a full-blown commuter with mudguards and front and rear racks. The point is I could get groceries or whatever without any fear of potholes and just barrel through. Or even as a weekend adventure bike. But, still with a semi-aggressive position so I could bend my elbows and lean forward to go faster if I'm really impatient. What bike is this? It looks modified. 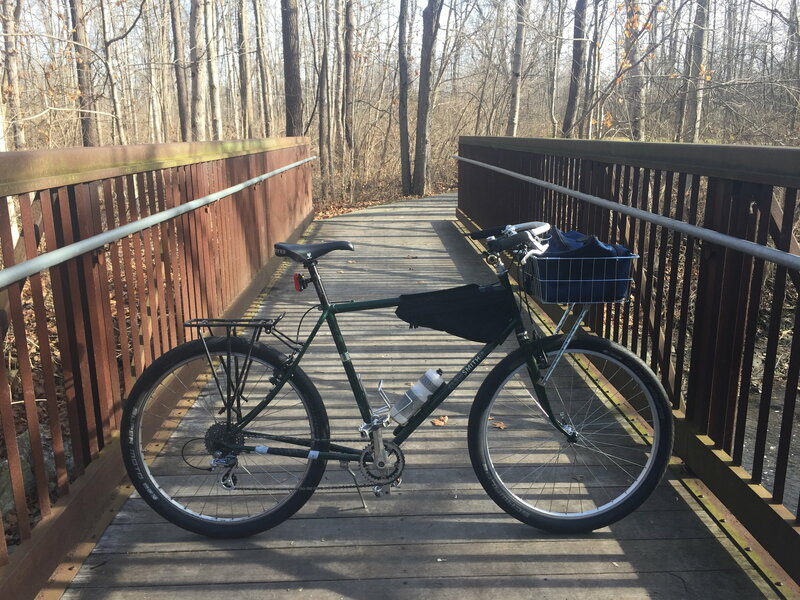 If you search for the name of the bike, "clem smith jr", you'll find that it's a Rivendell model -- very nice stuff. Is it me or your front mudguard is installed backwards? Edit: On second thought it's probably installed that way due to the rear facing fork crown. Last edited by andrei_r; 03-25-19 at 03:24 PM. The definitions seem blurry, but if we assume a hybrid is meant to be a "hybrid" of road and mountain bike, the 29+ isn't a contradiction. Most hybrids have flatbar, MTB groupsets and wider tires (compared to road), but have no suspension and a more road geometry.... and many variations of that. Most hybrids come with 700c wheels, which is the exact same rim as 29" (or called 28"in europe, but exact same size). 29+ is exactly like all the hybrids most manufacturers sell, just some wider tires for more comfort and our ever degrading roads.